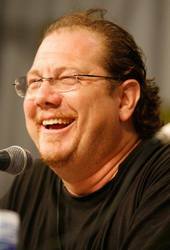 Fred Tatasciore is a voice actor/animator known for his work in film, television and games. He is the voice of Overwatch's "Soldier: 76". He is currently working with Disney Television on "Wander Over Yonder"("Monsters"), "TRON, Uprising" (Flynn and Clue), "Gravity Falls, "Phineas and Ferb", "Fishooks", and the new "Mickey Toons". He plays Tookit in "Thundercats", as well as Hulk/Bruce Banner, Beast, and Thing in countless animated roles. He can be heard regularly on Fox's "Family Guy", "American Dad", and "Cleveland Show". Other shows include various characters on "Robot Chicken", "Mad TV" (Animated), and Comedy Central's "Trip Tank". For Cartoon Network, "Adventure Time" (Manly Man), "The Regular Show" (various characters), "Mixels", "Ben 10" (RipJaws, Mile High, and Cannonbolt). His film work includes DreamWork's "Kung Fu Panda 2" (as Po's Panda father), Disney's "Frozen", "Enchanted" (as the Troll), "Entangled", "The Princess and the Frog (Gators), and "Planes" (various). Other films he voiced are "9" (as 8), and "Team America". Fred's work in video games also include "Gears of War" (Damon Baird), "StarCraft" (Zeratul), "Mass Effect" (Saren Arterius), " Call of Duty" (Nikolai Belinsky), and "Ratchet and Clank" (Neftin Prog).